When searching for American Western Art, art enthusiasts have the ability to choose from a variety of mediums including paint, bronze sculpture, tapestry and other tangible art items. This diverse selection allows American Western Art collectors to focus on one specific medium, or to mix and match different mediums to create a cohesive, American Western Art Theme. Art collectors, searching for the highest-quality and most detailed bronze western sculptures, should consider enhancing their collection with a detailed masterpiece from Joe Collins Sculptures. One of the most influential and recognized animals of the American West is the horse. North America Bronze Artist, Joe Collins, helps transform raw materials into multi-dimensional masterpieces. 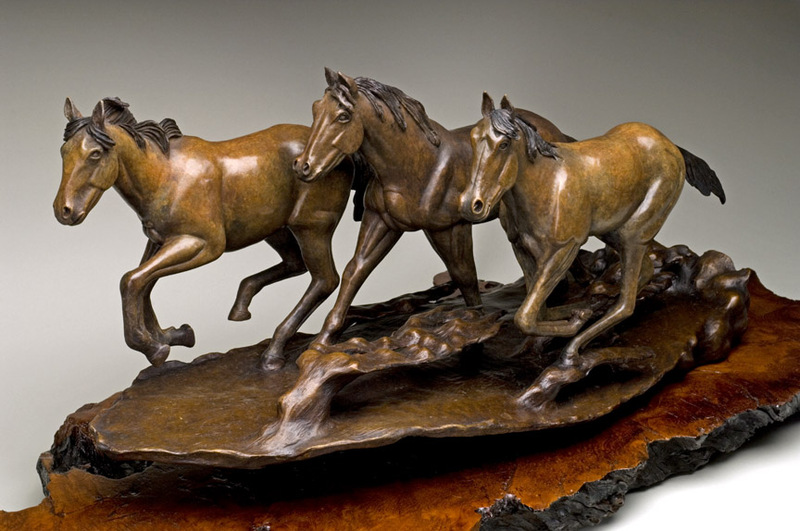 Creating sculptures with a predominant Western theme, every Western or Bronze Horse Sculpture is based on Joe Collins’ life-long experience with nature, wildlife and the American West. Highly-detailed, bronze three-dimensional sculptures are created that realistically reflect the true American West from a person who has lived and experienced the area’s animals, natural environment, diverse landscapes, pioneer-spirited people, and Native American culture. Joe Collins Sculptures is more that a place where people can view Western Native American Art. It is an outlet for an artist to give the gift of the American West to others. While many people have the ability to travel in the West, few can deliver it with precision, reality and accuracy like Joe Collins. A dedicated Bronze Sculpture Artist, Joe’s work has been featured in numerous exhibitions and galleries, including the Loveland Invitational Show in CO, the Breckenridge Fine Arts Center, the Oklahoma Art Guiild and many more throughout the Western United States. Presently residing in Virginia, Joe Collins has always been influenced by the natural environment. Growing up on a farm, Joe later worked in Natural Resource Management and enjoyed spending his leisure time pursuing outdoor activities. This love of nature allowed Joe to appreciate all that was around him; study, in intricate details, plants and animals, and to foster an interest in American Western culture. Displayed throughout his work, Joe has an appreciative and reverent respect for American Indians, cowboys and early Western pioneers. Each bronze sculpture tells a story by encompassing one or more aspects of the West: its people, landscapes, animals and history to create a lasting story that can be passed down from generation to generation. Please feel free to browse our gallery. If interested in purchasing one of Joe Collins’ sculptures or would like to discuss a particular piece in further detail, please contact Joe via email using the Contact link, found at the top of the page.